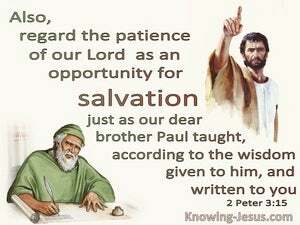 And consider [that] the patience of the Lord means [further opportunities for] salvation, [just] as our dearly loved brother Paul also wrote to you, using the wisdom given to him by God. 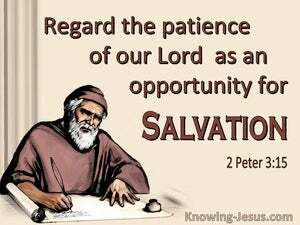 And regard the patience of our Lord as salvation; just as also our beloved brother Paul, according to the wisdom given him, wrote to you. And reckon the long-suffering of our Lord, to be for salvation; as also our beloved brother Paul, according to the wisdom given to him, has written to you. Regard our Lord's longsuffering as salvation; even as our dear brother Paul also wrote to you, according to the wisdom given to him. Regard our Lord's forbearance as your one hope of Salvation. 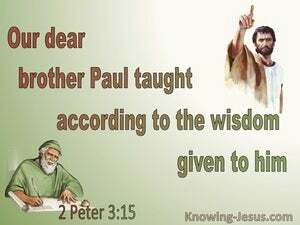 This is what our dear Brother Paul wrote to you, with the wisdom that God gave him. 14 Therefore, beloved, since you look for these things, be diligent to be found by Him in peace, spotless and blameless, 15 and regard the patience of our Lord as salvation; just as also our beloved brother Paul, according to the wisdom given him, wrote to you, 16 as also in all his letters, speaking in them of these things, in which are some things hard to understand, which the untaught and unstable distort, as they do also the rest of the Scriptures, to their own destruction.